Unfortunately, Peziza arvernensis is likely to require microscopic examination to identify with certainty. 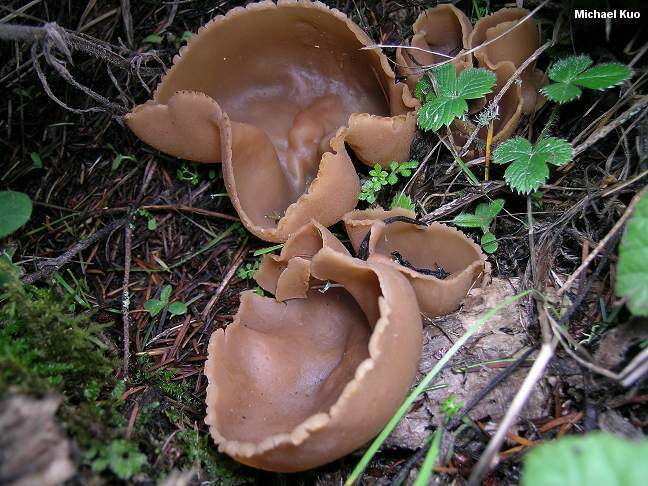 Like a host of cup fungi it is brown and boring, and not particularly distinctive to the naked eye. Its undersurface is finely velvety with whitish fuzz, and it is attached to the substrate in a central location. It grows in woods, and tends to fruit on the ground in places that have accumulated woody forest debris--which helps to separate it from several similar species of Peziza that grow on dung or directly on rotting wood. 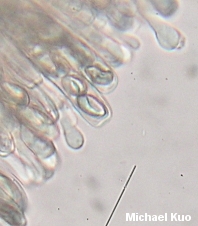 Under the microscope, Peziza arvernensis (which will be called "Peziza sylvestris" in many field guides) has spores lacking oil droplets, measuring 14-20 x 8-10 µ, and (occasionally) becoming slightly warted at maturity. Its asci have blue tips in Melzer's Reagent, and its paraphyses (special sterile cells between the asci) are skinny, with swollen ends. Ecology: Saprobic, growing alone or in clusters on the ground in hardwood and conifer forests, usually in areas that have accumulated woody debris; spring through fall--or in winter in coastal California; widely distributed in North America. Fruiting Body: Cup-shaped when young, often flattening with age or becoming irregularly shaped due to the clustered growth habit; reaching a width of about 8 cm across; upper surface brown and fairly smooth, sometimes becoming slightly wrinkled; under surface minutely velvety with whitish fuzz, at least when young; without a stem; attached to the substrate at a central location. Odor none. Flesh fragile and brittle. Microscopic Features: Spores 15-20 x 9-10 µ; smooth when immature, sometimes becoming finely warted with maturity; elliptical; without oil droplets. 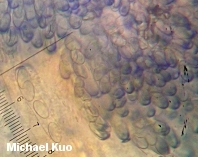 Asci eight-spored; with blue tips in Melzer's Reagent; up to 235 x 15 µ. Paraphyses slender, with swollen tips. REFERENCES: Boudier, 1879. (Seaver, 1928; Arora, 1986; Evenson, 1997.) Herb. Kuo 01130506. Kuo, M. (2005, January). Peziza arvernensis. Retrieved from the MushroomExpert.Com Web site: http://www.mushroomexpert.com/peziza_arvernensis.html.